How Does Gum Disease Affect Your Facial Appearance? When allowed to progress far enough, periodontal disease can destroy enough of your oral tissues to cost you one or more teeth. Although tooth loss can be a devastating result of the disease, it is not the end of your dental troubles. Even if you treat the disease that cost you one or more teeth, their loss may be just the beginning of a host of concerns, including the destruction of your smile’s foundation. Today, we explore the resounding effects that tooth loss can have on your oral health—specifically your jawbone—and how those effects can be seen increasingly more in your facial appearance. The roots that are embedded into your jawbone do more than just keep your teeth steady; they also facilitate a healthy supply of nutrients to your jawbone when they’re stimulated by biting and chewing. The loss of teeth roots can mean a diminished nutrient supply to your jawbone, which in turn could lead to its erosion, or resorption. As your jawbone shrinks, the effect can be seen in your facial features, a condition commonly known as facial collapse. To replace missing teeth and their roots, your dentist may recommend dental implants, which are small, root-shaped devices that are surgically inserted into your jawbone. 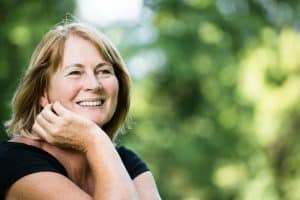 Aside from providing a sturdy base, dental implants can also restore the stimulation that was lost with your natural teeth, thereby restoring the stimulation that keeps your jawbone strong and youthful looking. With regular periodontal maintenance, you can also ensure that gum disease doesn’t resurface and lead to further tooth loss, which can increase your risks of experiencing facial collapse. Gum disease, tooth loss, and facial collapse are all connected, and with help from your periodontal specialist, you can help your smile and facial features recover successfully. To learn more, schedule a consultation with Dr. Kania by calling her periodontal office in Encinitas/San Diego, CA, at (760) 642-0711.